If you've never been to an auction or you haven't been in a while, the auction experience is something worth checking out. Selling at auction provides our customers with a fast, inexpensive way to make money. You can expect a check 14 business after the auction with no "hidden cost" or advertising fees. 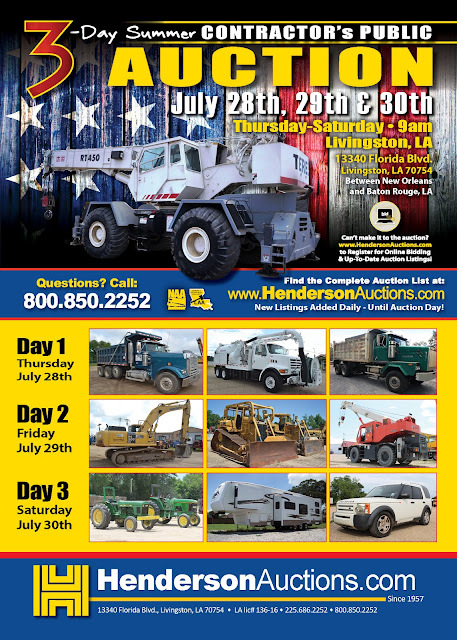 Call our office to discuss our flexible auction terms 800-850-2252 or 225-686-2252, you can also email sales@hendersonauctions.com for any consignment questions. Our 3-Day Quarterly Auctions offer a wide variety of consignment opportunities...meaning we will sell almost anything and it will bring the highest net yields! Henderson Auctions has been in business for 59 years! We love our buyers and sellers, our goal is to not only become business partners but friends. We aren't the largest auction company in the world but we compete right along side our publicly traded competitors selling world-wide with (3) different online auction services companies www.proxidbid.com, www.hendersonauctions.com and www.bidspotter.com. Give us the opportunity today to prove the value of Auctions!